Today we’d like to introduce you to Scott Hollander. I’m originally from Highland Park and I went to Deerfield High School. I went to undergrad at the University of Wisconsin – Madison and then law school at Northwestern University. Several years ago, between undergrad and law school, I was camping in the Bighorn Mountains of Wyoming. One of my friends, who was from Sitka, Alaska, showed me how to throw an axe. Since then, I have enjoyed casually throwing axes, knives or darts when the opportunity arises (which is typically on camping trips). After law school, I worked as a commercial litigator for over two years. It wasn’t until I quit my law job and went travelling to Montreal with friends that I learned about indoor axe throwing. As soon as we came across the axe throwing range in Montreal (called Rage Montreal), I became interested in bringing that experience to Chicago. There have definitely been struggles. 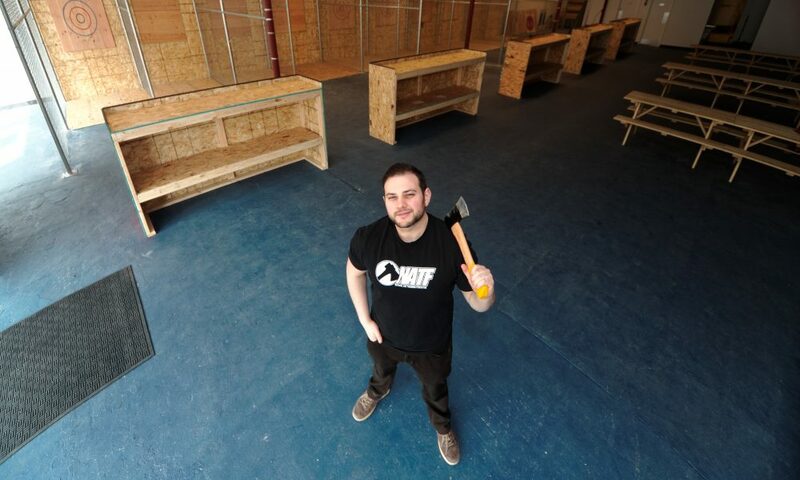 I have never owned a physical business before and it was very much a homegrown project, from building the website to building the actual axe throwing range. The first major struggle was finding a space. It took about two months to find a space that was large enough, open enough, and affordable. Then began the long process of securing building permits and a business license. Such a process is almost never quick or simple, and with my particular business, there were many complexities, delays, and unexpected changes and costs. This took many months and was probably the toughest and costliest part of starting the business. Now I can finally spend my time on management and marketing, which is the experience that I originally expected. Overall, I expected a ton of work, but was still surprised with what was required to make Thunderbolt a reality! So let’s switch gears a bit and go into the Thunderbolt Chicago Axe Throwing story. Tell us more about the business. First, we’re more than just an axe throwing range operator. Our coaches work with struggling customers to help them succeed in throwing axes and learn this new skill. We also focus on creating a fun environment. We teach the basic competitive game and enjoy running group tournaments, teaching alternative throwing techniques, and playing good axe throwing music – it’s really a full-service axe throwing experience. Aside from that, the thing I’m most proud of is that Thunderbolt is all about accessibility. Many other axe throwing ranges are focused on special events of 8+ or 12+ people, with a minimum of a couple hours and a cost of over $40 per person. And of course, Thunderbolt loves to do these types of events. But Thunderbolt is also open five days per week and is available for walk-in groups of any size – similar to a bowling alley. People can simply drop in and play for an hour, which costs $15-$20 per person. My hope is that this allows all people who are curious about axe throwing to experience it, on their own terms. Lastly, we’re a pretty large range, with ten lanes. This means that, especially for special events, customers will spend less time waiting for their turn and more time throwing axes! That’s a tough question, because luck often occurs undetected. As for my life, I think that’s far too daunting of a question to answer concisely. As for business, my opinion is that luck plays a role, but is rarely a determining factor. For example, luck may determine the quality of your options for real estate, business partners, professional services, or city employees. In other words, luck determines your initial pool of options and resources. From a practical perspective, all you can do is take those raw options and resources and make the best of what you’ve been given. So far, the #1 lesson that I’ve learned about starting a business is that you have to see everything to its conclusion and that it’s simply never an option to decide that something is “too hard.” Bad luck makes things more difficult and good luck makes things easier, but in the end, you need to find a way to accomplish each step in the process. So, if you’re going to survive, you have to approach everything with commitment and accountability.